In his younger days, Dhyan was not much interested into sports although he liked wrestling a lot. He started playing Hockey with his friends who used to themselves make Hockey sticks from tree branches and balls from ragged clothes. At the age of 14 years he visited a Hockey match with his father, where one team was down by 2 goals. He insisted his father to play from the losing side, and when an Army Officer let him do so, Dhyan scored 4 goals for the team. Impressed by his skills, the Officer offered him to join the army and at the age of 16 years Dhyan was inducted into the Punjab Regiment as a Sepoy in the year 1922. Subedar Major Bhole Tiwari of Brahmin Regiment became Dhyans mentor inside the Army and taught him the basics of the game. Pankaj Gupta was the first Coach of Dhyan Singh who predicted that one day he would shine like the Moon, called Chand in Hindi. 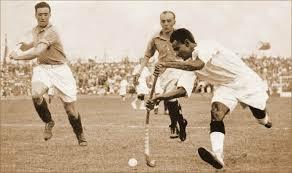 Hence, Dhyan Singh came to be known as Dhyan Chand after that.